People who wear earrings, from babies to mothers, can experience painful, itchy rashes and blisters caused by allergic reactions to nickel or other metals. 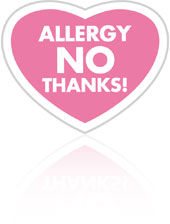 Nearly 20% of people around the world are allergic to jewelry. Nickel is usually the culprit, but people are also allergic to gold, silver and other metals used in jewelry. Additionally, the piercing can create serious health problems if not done correctly. I am Dave Loftus, and along with my daughter Christine, we started Blomdahl USA to help empower women by offering a safe alternative to tattoo parlors, unregulated shops or risky in-home amateur ear-piercing. We learned about a new, safe and sanitary system for piercing ears for babies, toddlers, teenagers and adults. It’s called the Blomdahl Medical Ear-Piercing System. It features a single-use disposable cassette containing a sterile ear-piercing medical grade earring with the earring back. The earring pierces and attaches in one swift motion. However, sanitary ear-piercing was only the beginning. Today, Blomdahl USA is the leader in nickel-free, hypoallergenic earrings and other jewelry. We specialize in medical grade titanium earrings and medical grade plastic earrings for people with sensitive skin and allergies to jewelry. Our company began selling beautifully crafted, medical grade, hypoallergenic jewelry. Anyone can wear it because it’s skin-friendly and allergy-free. We recognized the demand for gorgeous earrings, necklaces and bracelets that people with sensitive skin can wear. Today, our collection includes medical grade titanium earrings, medical plastic earrings, skin-friendly necklaces and bracelets. Each piece that features a gold or silver coating, that coating is only applied to the parts of the jewelry that does not directly contact the skin. The process ensures completely skin-friendly jewelry. Working in close collaboration with dermatologists, pediatricians and jewelry designers, Blomdahl created a line of elegant jewelry for babies, kids and adults. Some skin-friendly examples include titanium stud earrings and medical grade plastic earrings in a variety of sizes and shapes. 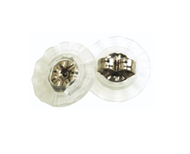 We offer both titanium and medical plastic earring backs so you can wear them comfortably all day, worry-free. Additionally, our earrings use only genuine Swarovski crystals and high-quality Cubic Zirconia (CZ) to add brilliance and sparkle. We manufacture your earrings under strict sanitary controls. When you purchase hypoallergenic earrings from Blomdahl USA, you are the first person to touch them. The jewelry stays in a safety sealed hygienic Clean Pack until the moment you open it. You are buying directly from the manufacturer. There’s no repacking involved. Blomdahl USA has a quick order turn around. We usually ship with 24 hours after receipt of your order. Your earrings are never more than a few days away. You can order your earrings for those just-in-time events and know they will arrive on time. If you have any questions, our customer service is waiting to help. We guarantee your satisfaction when you purchase any of our skin-friendly jewelry. You get a full 30-day money-back guarantee on each piece. If you need hypoallergenic earrings for a first-time piercing, Blomdahl USA has two lines for sensitive ears, titanium and plastic earrings. Titanium is a durable metal that won’t cause allergies. That’s why medical facilities use titanium for implants. Both titanium stud earrings or plastic are an excellent choice for babies and kids. Blomdahl USA empowers moms and all women by providing a safe and beautiful alternative to bland medical jewelry. We also offer the safest, pediatrician-approved medical ear-piercing system for babies and adults. The Blomdahl Medical Ear-Piercing System is only available through a network of physicians and nurses. Order today and try our elegant, worry-free jewelry that you can wear anytime.